1. 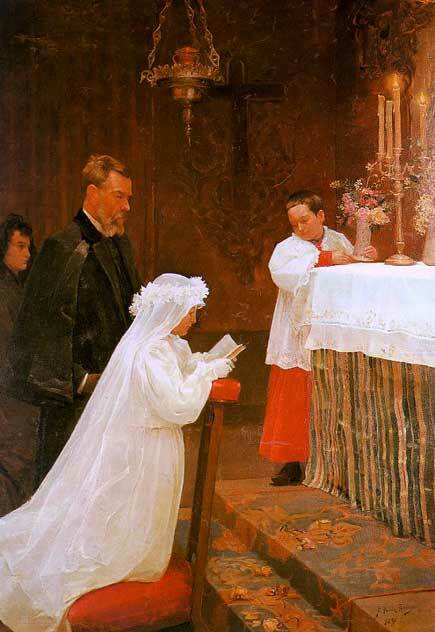 The painting depicts Pablo Picasso’s sister, Lola, at her first communion. The man at her side is either modeled on their father or on Vilches, a doctor and a friend of the family. The young altar boy is Pere, Vilches’ son. See more of the article at Mental Floss. I just love art. My walls are covered by prints I've found interesting, unique, strange and peaceful. I'm not an expert, just a avid looker, ponderer and enjoyer of visual art. I've never seen that painting by Picasso... I like it. No, sorry, I'm not a Picasso afficiando. Vincent Van Gogh is one of my main artists. However, I was painting at age 14... though, my abilities will never be recognized. Hey Savanna, Van Gogh is wonderful as well. I have a print of his Sunflowers on Blue in my bedroom. Those sunny yellow flowers are a sure way to lighten ones day. I'm also a huge fan of George Seurat. His pointilist works astound me.